What do we need for a translation? An object. And how much to move which way, otherwise known as distance and direction. My students have some experience with translations before they get to my high school geometry course…but mostly their experience is with translating an object 2 units right and 1 unit down. 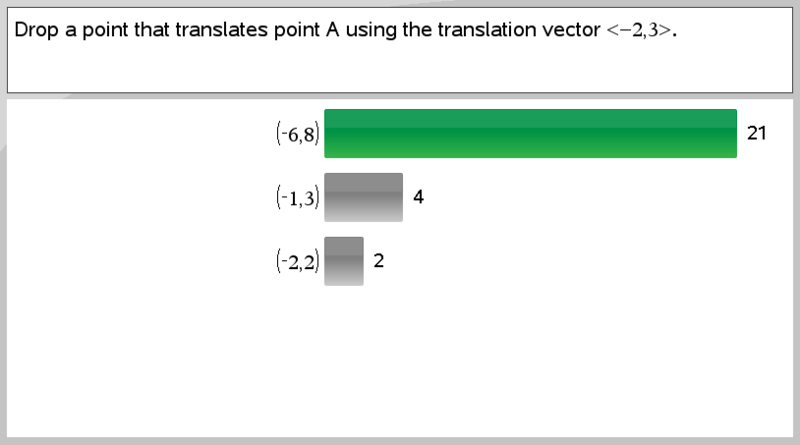 So the first Quick Poll I posed in our lesson on translations was to see what they would do with a vector translation. Most of them concluded that the vector was giving them the x-component and the y-component of the translation without me having to tell them. But here is what I really wanted to know. 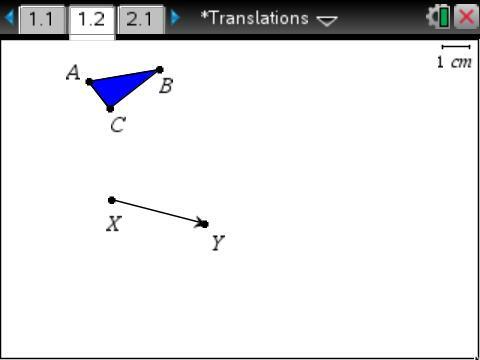 We were about to explore what translations buy us mathematically using TI-Nspire Technology. And we were going to use a vector as the means for giving us the information we needed for our translation. 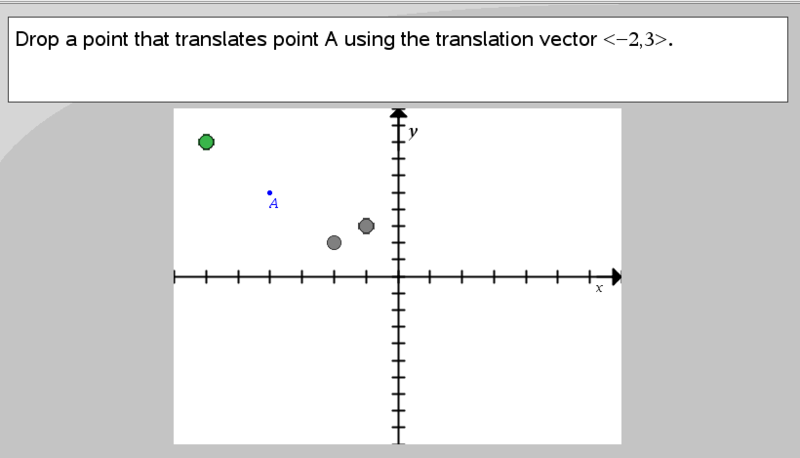 I wanted to know whether the students could use the vector to perform the translation without the technology. So I asked students to predict the image of ΔABC when translated using vector XY. As you can imagine, most students put ΔA’B’C’ down and to the right of ΔABC. But I was ready for them to attend to precision. 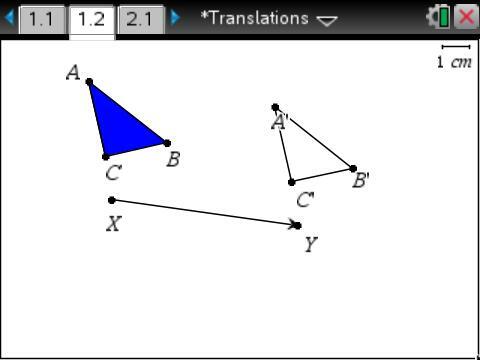 I was ready to know if they really knew how far right and how far down the vector was telling us to translate ΔABC. Just for the record, they had no idea how far right and how far down the vector was telling us to translate ΔABC. But I wasn’t ready to tell them. I asked again. And I waited. How does the vector give us information about distance and direction? 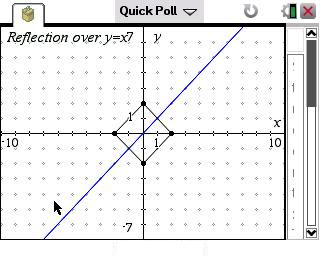 It was uncomfortable for the students to have the images in a general plane instead of the x-y coordinate plane. But I began to hear some good words from the group conversations: “right triangle” from one, “hypotenuse” from another. 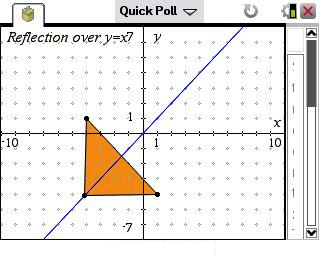 And the students began to make sense of the x- and y-components of the vector, even though they didn’t initially see them. The students began to look for and make use of structure by drawing in a right triangle with the vector as the hypotenuse. And they began to refine their translation from the initial red figure (right and down) to the actual image of ΔABC using vector XY. At that point, I let them use their dynamic technology to translate ΔABC. And I asked them to write down everything they could find that was congruent. This took longer…because they focused first on the triangles. 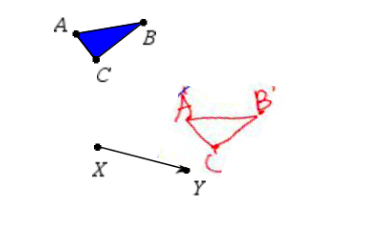 A translation is a rigid motion, and so ΔABC is congruent to ΔA’B’C’. And then that means that segment AB is congruent to segment A’B’. 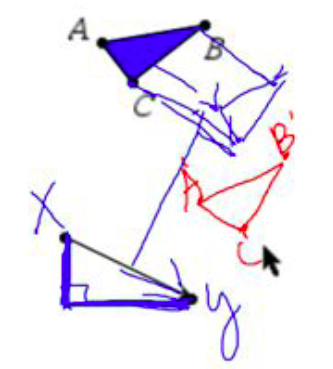 And the perimeter of ΔABC is equal to the perimeter of ΔA’B’C’. And the areas of the triangles are equal. And the corresponding angles are congruent. But what else has to be congruent? Finally, someone suggested that CC’ is congruent to AA’. Really? How do you know? And do others agree? 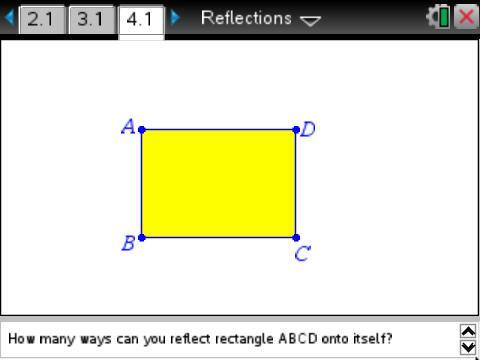 So we took a bit more time, and the students decided that AA’ is also congruent to BB’, which is also congruent to XY. And then several noticed that not only were those segments congruent…but they are also parallel. And so the journey continues …. 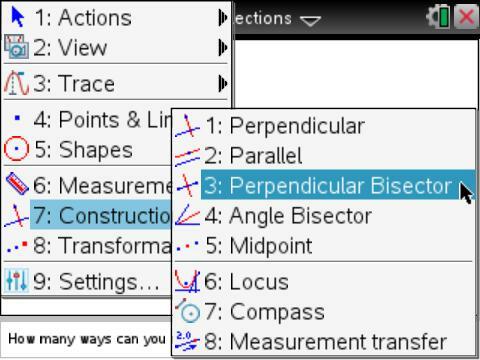 Note: We used the Transformations – Translations lesson from Geometry Nspired as a guide for part of our exploration in this lesson. We are incorporating this learning objective into our unit on Rigid Motions. And we are still learning how best to ask questions to get students thinking about how to carry an image onto itself. We started with a rectangle and asked students to perform a reflection that would map the image onto itself. A few students tried to “eyeball” where they could draw a line of reflection. But I was excited at how many used the Construction tools to construct a line of reflection. 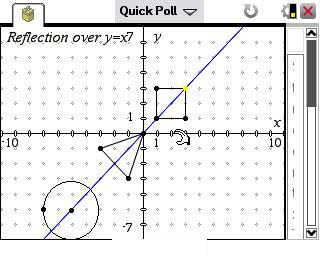 Some chose to construct the perpendicular bisector of a side of the rectangle. 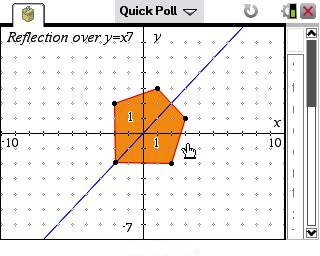 Some constructed the midpoints of more than one side of the rectangle and then used the segment tool to connect. Some constructed the midpoint of one side of the rectangle and then constructed a perpendicular to the side through its midpoint. One nice feature of the TI-Nspire CX is color. I made sure that the rectangle had a colored border so that when a student reflects the image onto itself, the result will default back to a black border, instead of the blue border of pre-image. 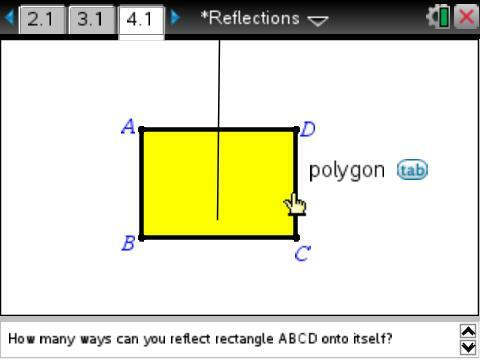 For those without CX models, students can hover over the border of the rectangle and see that the reflection worked when they see the object selection “polygon” on top of the rectangle. After reflecting the rectangle onto itself, we grabbed movable vertices of the rectangle to make sure that the reflection “stuck”. Those students who drew instead of constructed a line of symmetry for the rectangle soon saw two rectangles instead of only the one. So they undid their work and tried again constructing a line of symmetry. 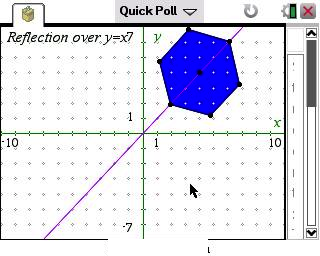 I gave students a hexagon next…This time most didn’t have to actually construct any lines of symmetry to come up with a solution. So how could we take this to the next level? Students know that reflecting an image about a line of symmetry will carry the image onto itself. 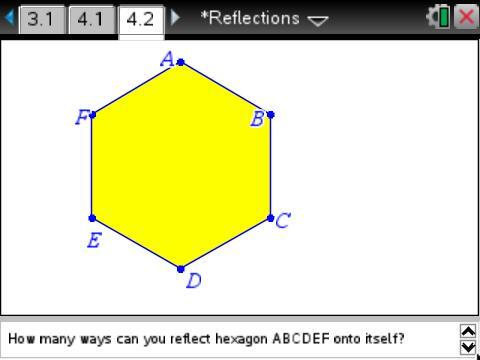 In the next lesson, we asked students to create an image that would map onto itself when reflected about a given line. We started with the line y=x. 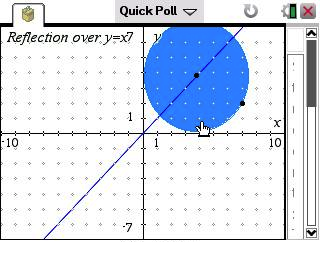 I was surprised at how many students thought to create a circle with its center on the line. I would not have thought of a circle myself since we have mostly been reflecting, translating, and rotating polygons. Others created triangles, regular pentagons, regular hexagons, squares. We got to see everyone’s work using the Class Capture feature of TI-Nspire Navigator. And we got to talk about the properties of the shapes (will any triangle work?) and the coordinates of the vertices. Rotations are next…We will see what happens when we begin rotating an image onto itself. Or creating an image that can be rotated onto itself.